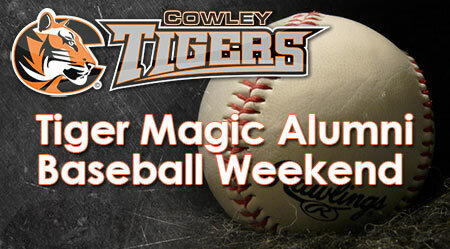 Any former Cowley College baseball player from the program’s inception in 1970 through this past season’s team is invited to attend the Tiger Magic Baseball Alumni Weekend on September 9-10 in Arkansas City, KS. Tiger head coach Dave Burroughs along with assistant coaches Darren Burroughs and Brock Buckingham have long discussed having a weekend full of events for baseball alumni. On Friday, September 9 a social will be held at the VFW in Arkansas City at 7 p.m. On Saturday, September 10 a golf outing will take place at 8 a.m. at Great Life and Fitness Golf Course with a Home Run Derby to follow later in the afternoon at the Tiger Baseball Field. For more information or to reserve a spot at the Tiger Magic Baseball Alumni Weekend call 417-850-2032. For the Alumni Weekend reservation form, click here.